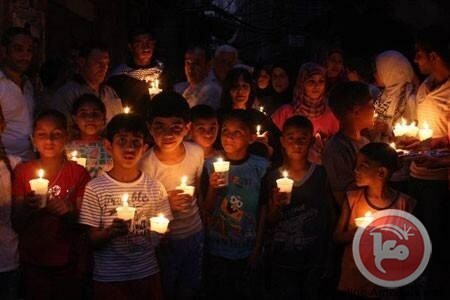 BETHLEHEM (Ma’an) — The Israeli security cabinet has approved a 40 percent reduction in Israel’s electricity supply to the besieged Gaza Strip, where Palestinians are already coping with a crippling power crisis and daily, hours-long blackouts, according Israeli media reports. While Gaza’s electricity company said it had not received an official order regarding the impending power cut, it called upon Palestinians in Gaza to prepare for the worst, while human rights groups urged Israel to reconsider the move — expected to have immediate and disastrous effects on the medical sector in particular. The approval came after Israeli authorities announced plans to make the cuts last month, upon request of the Palestinian Authority (PA) in occupied West Bank, which foots Gaza’s monthly electricity bill from Israel, by subtracting from taxes collected by Israel on behalf of the PA.
Palestinian President Mahmoud Abbas had reportedly informed Israel that the PA only intended to pay 60 percent of the 40 million shekel ($11.19 million) monthly bill, as Hamas, the de facto ruling party in Gaza, and the Fatah-led PA continued to blame each other for a deepening crisis in Gaza. Meanwhile, the Gaza electricity company said on Monday that it had been informed by Egypt’s power company that it could cut off power lines feeding Gaza at any time, without providing further details.